Introducing, the world's first Disposable Single-Use Unlubricated Monocle, for the On-the-Go Gentleman (or Lady). 5,093 backers pledged $127,155 to help bring this project to life. Gentlemen (and Ladies! ); Have you ever found yourself in Need of that Certain Protection one wants for a Night On The Town? Stop talking like a Victorian stereotype! Okay, sorry, sorry! It's habit-forming. What is it, you ask? It is a monocle (with a 2.5" chain!) inside a sealed, tearable wrapper. If you require an instantaneous boost to classiness, this product is for you. Just to be absolutely clear, because people have asked: It is not a condom. It is made of hard plastic and metal. If you attempt to use it as a condom, you will definitely hurt yourself, and you may experience the miracle of life. The monocle looks like, well, a monocle. The container (pictured below) is a clear plastic wrapper with one metallic side. We figure this product is a joke you tell with a prop. So, rather than having you open a new one every time you show it to a friend, you can just show off the clear back. That way, everyone can see that (yes really) there is a monocle in that suspicious little wrapper. For when you DO want to actually open it, we offer a variety of multi-packs, so that you are never without fresh ocular protection. Although we have worked hard to keep the price low, we have also taken care to make sure the monocle is of a better quality than the cheap ones you usually see in novelty shops. Our monocle is mostly plastic, with a metal chain that gives it a pleasant jingle, and color choices that give it a realistic look. The monocle itself is very durable and would be a fine addition to a cosplay costume. Our baseline offering is the 1-Pack. We will pop a monocle in an envelope and mail it to you. Our recommended offering is the 3-Pack. It comes in a lovingly-designed box (pictured below), designed by Mr. David Malki. This image is a digital mockup. The final product may vary slightly. We are including a 200-Pack option for the most vigorous of socialites. If you do purchase one, we assume you either own a novelty store or are an eccentric genius. Either way, Zach will personally write you a letter, in his finest calligraphy, thanking you for your purchase and encouraging you to seek help. The monocle frame (made in USA) is made of custom color durable ABS plastic designed to match the chain. The "lens" (made in USA) is clear, high clarity NAS plastic. The chain is composed of iron (made in China). The wrapper is composed of polyethylene (made in China). Everything is assembled, packed, and shipped in the USA. We are proud to say our assembly is done by P.R.I.D.E.CO in New Jersey. Yes! It will not fit quite as well as a fitted monocle. These really should only be used in emergency monocle situations, such as the one pictured on our promotional video. After a bit of testing, we've found that the main factor in how easily the monocle sits on your face is how much your forehead protrudes. We theorize that this explains why monocles were most popular among Europeans, who have a large amount of Neanderthal DNA. This project is made possible with the help of Richard Beneroff of Greenway Pkg and the engineering and project management of Josh Greenhaus. Product photos by Robin Dillon (rdillon58@hotmail.com). WARNING: CHOKING HAZARD -- Product contains small parts. Not suitable for young children. The main risk is that we've never done this before! Normally we just make books, for which the supply chains are quite simple. In this case, the process is a bit more involved. That said, we have already prototyped out what the final piece will be. In fact, due to the nature of making products like this, we already have about a thousand on-hand from the sampling process. So, what you see will be what you get. And, unless something very surprising happens, we expect no complications in the production or shipping process. If for any reason something does go wrong, it is our policy to maintain transparent communication regarding the status of the product. We have one other project right now (Augie and the Green Knight), which we are currently fulfilling. All of the product work is done. We are simply waiting on the books to arrive at our warehouse to be mailed out. One single-use unlubricated monocle will be delivered directly to your place of dwelling. Early Buyer 3-Pack: 3 monocles in a lovingly designed paperboard box will be sent your way. Your 3-Pack will be assembled from our of initial production run, so it will ship earlier. 3-Pack: 3 monocles in a lovingly designed paperboard box will be sent your way. 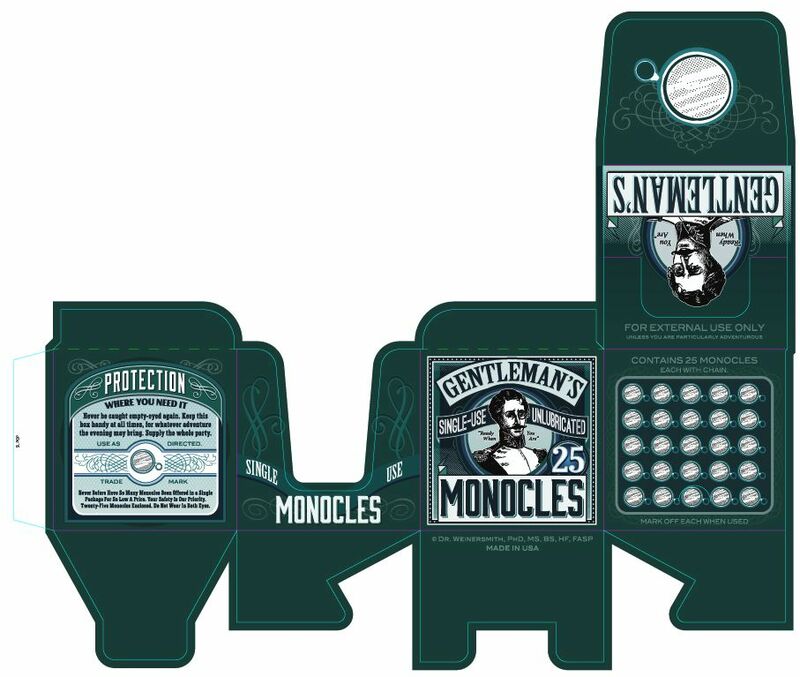 Double 3-Pack: You will receive 2 of the 3-Pack for a total of 6 monocles. 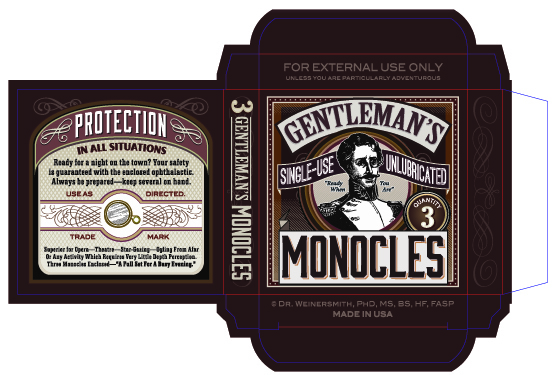 Quadruple 3-Pack: You will receive 4 of the 3-Pack for a total of 12 monocles. 25-Pack: We see you are a very "active" individual. Congratulations on your success. You will receive 25 monocles in a larger display-style container. 25-Pack and Quintuple 3-Pack: My goodness, you must be a very social being. You will receive 1 of the 25-Pack and 5 of the 3-Pack. Double 25-Pack: A must have for those planning a day of aerial philanthropy via hot air balloon. You will receive 2 of the 25-Pack. 200-Pack: We will send you 8 of the 25-Pack, with a personal letter from Dr. Weinersmith, advising you to seek greater moderation.